Obviously useless but as a work of art: totally essential. The Ralph Lauren American Western collection offers a nice variety of leather strap watches as well as pocket watches. Both the leather strap watches and the pocket watches are available with an antiqued sterling silver case or with a rose gold case. 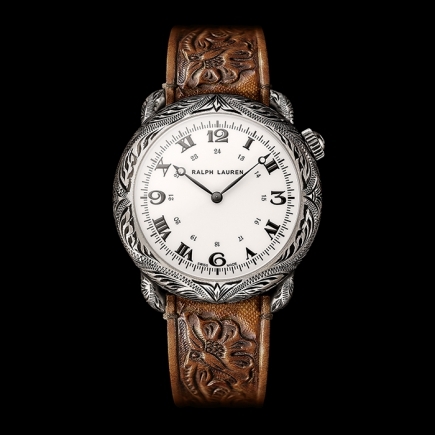 The American Western leather strap watches offer two different interpretations of the Ralph Lauren Texan style: one model has a round-shaped case and the other model presents an unusual cushion-shaped case. 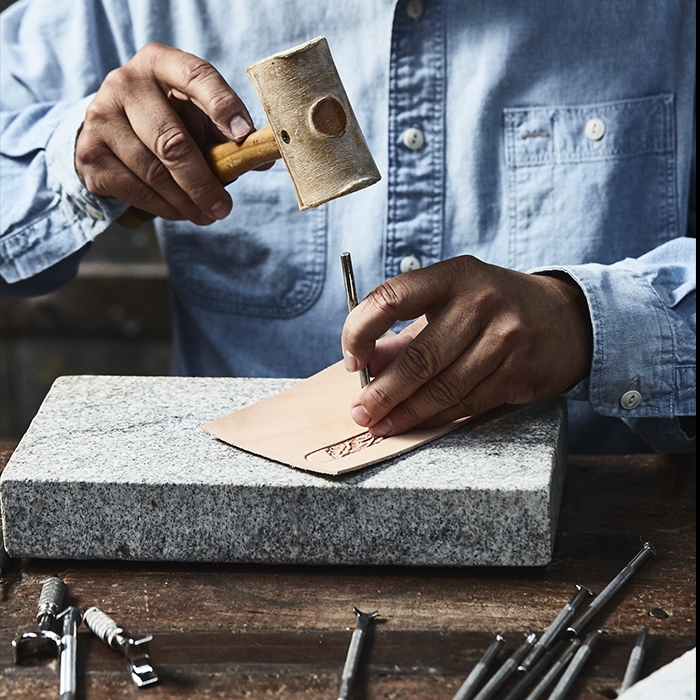 With the release of his new American Western collection, Mr Ralph Lauren wanted to create an attractive, unique and authentic collection. For his American customer base, but not only. He was aiming to design a Ralph Lauren collection to his image. A watch that would reflect his personality. 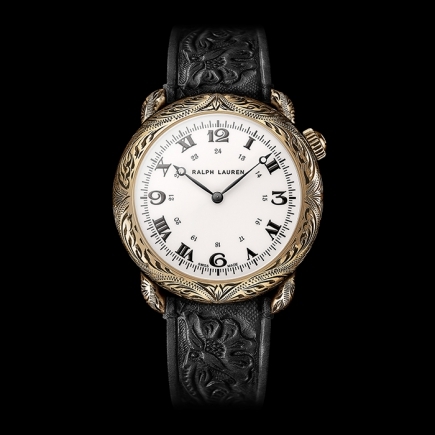 And within the Ralph Lauren American Western collection, probably the most interesting models are the two round pocket watches: these models can be considered as real collector pieces for purists. 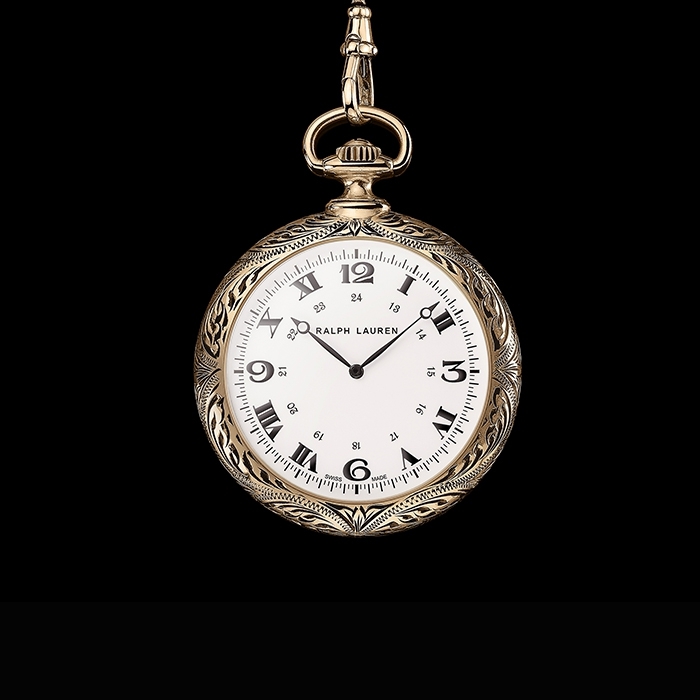 The Ralph Lauren American Western pocket watch has a round 50 mm rose gold case finely decorated and hand engraved. 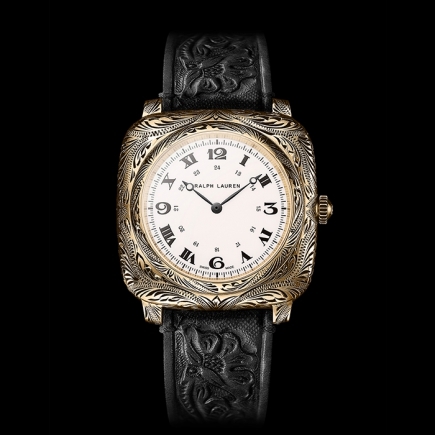 This model is essentially the pocket watch version of the 45 mm round-cased model mounted on a black leather strap. The pocket watch model, with its rose gold chain, displays an authentic, vintage Texas style that will be particularly appreciated by purists. On both the round pocket watch and the round leather strap watch, the rose gold of the case offers a beautiful contrast with the off-white colour of the dial. 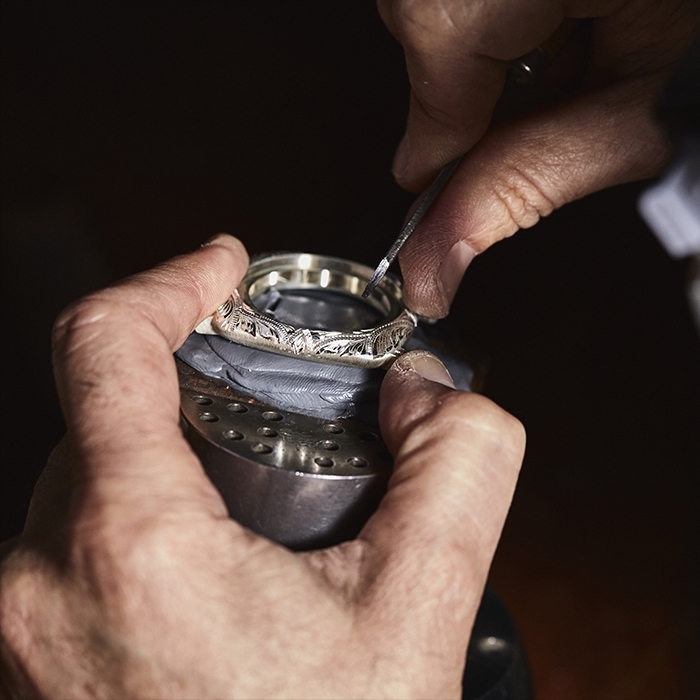 The engravings on the watch case create black shades and patterns that are in perfect harmony with the black, alternating Roman and Arabic numerals on the dial. Not to mention the fine Breguet hours hand and minutes hand that smoothly circle around the dial, as if they were pointing to the engravings on the case. 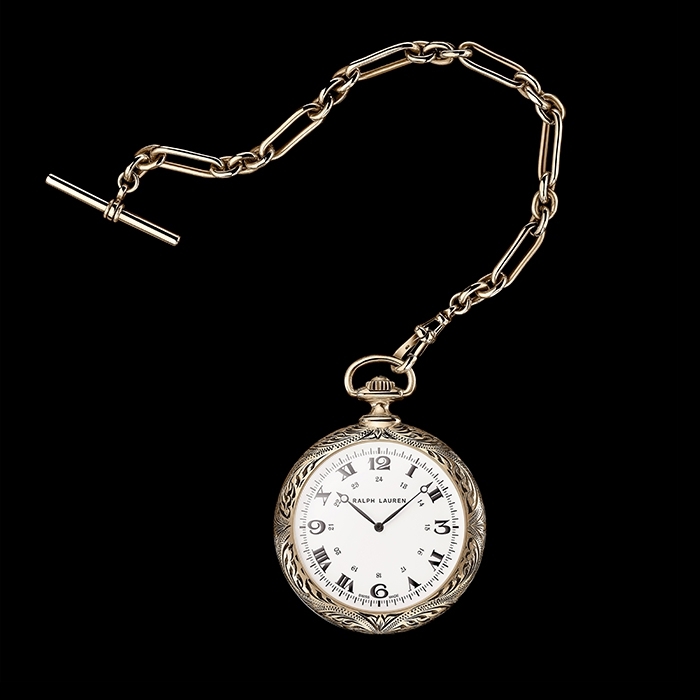 What Ralph Lauren has placed within the case of this watch is just as impressive as the rest since this pocket watch is equipped with a Swiss caliber developed by IWC and modified for Ralph Lauren. The manually winding RL98295 caliber has 18 jewels, an 18,000-vph frequency, and a 45-hour power reserve. It is extremely rare to see an IWC caliber placed in the watch case of another brand, so this makes the Ralph Lauren American Western pocket watch all the more special. Again, purists and watch aficionados in search of something different, will walk around with the serene, secret knowledge that that their precious pocket watch beats to the rhythm of an extremely reliable IWC Swiss caliber. A priceless feeling. A perfect choice for those gentlemen going beyond the fashion giant’s iconic polo styling. The Ralph Lauren American Western collection is simply rugged, authentic, sensible and elegant.